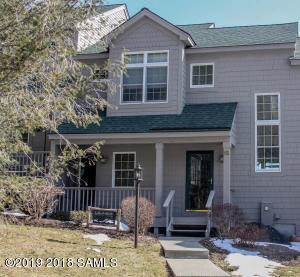 Panoramic lake & mountain views from all 3 levels of this remodeled and meticulously maintained townhome in the coveted maintenance free community of Green Harbour. Top floor master bedroom suite includes an M/B with vanity & shower, whirlpool tub & dressing area w/ generous closet space. The main floor's open floor plan includes a upgraded kitchen featuring granite counter tops and endless lake & mountain views. The spacious living & dining rooms share a wood burning fp & flow into an exterior balcony deck & 4 season sitting room with lake views. The lower level includes two bedrooms with jack/Jill full bath, bonus room, laundry, utility rooms and outside patio. Amenities: Heated pool & clubhouse, tennis courts, grand beach area and deeded use of a 21 ft. dock.